We use 5-axis CNC machining centres that represent the latest technological advances. Our machining centres belong to the longest ones in Finland which allows us to work on profiles up to 15,5 metres long. Aluminium welding is conducted with years of experience using MIG and TIG equipment. 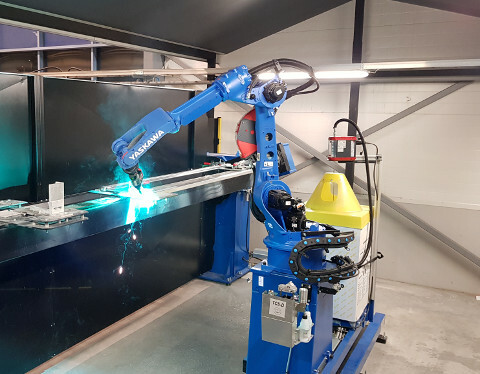 A robotic welding cell is our latest investment in aluminium welding. Our extensive expertise and knowledge of each customer's unique needs ensure high-quality results. If needed, we can include acquisition, storage and surface treatment of aluminium profiles as well as the required assembly and installation services into the delivery according to the customer's wishes. The Emmegi Satellite XT represents the latest advances in the field of aluminium machining and it allows us to machine aluminium profiles with even more efficiency, precision and versatility than before. The machine is the first of its kind in Finland and it is one of the factors propelling us forwards as pioneers of aluminium machining in Finland. These machines allow us to create slots, holes, threads, notches, etc. into aluminium profiles with extreme precision. The milling can be done onto the piece at any angle, even at the ends of the profile. We also utilise special measuring technology that allows us to achieve the desired specifications with even more precision than before. Robotic welding cell increases the productivity of aluminium welding. Due to the long distance between the fixture plates it's possible to weld also several meters long products.